If you are a regular reader you will know that we really like signs (and sometimes climb over guard rails to photograph them) and that we have been following the Pittsburgh Signs Project from its beginnings as a blog to a published book. 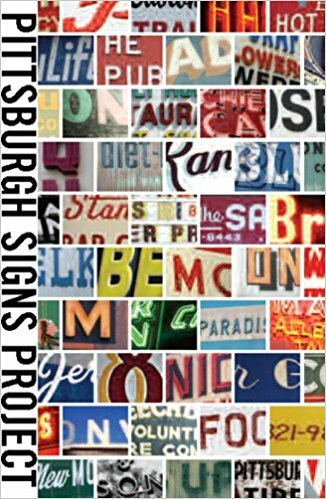 The book – Pittsburgh Signs Project: 250 Signs of Western Pennsylvania – is now available on Amazon.com. I have a copy and I gave some copies of the book to friends for Christmas. It is even easier to order a copy for your friends who don’t live in Pittsburgh. Pittsburgh Signs Project: 250 Signs of Western Pennsylvania is now available for sale at Carnegie Mellon’s University Store in the shop or online, the Mattress Factory Museum (North Side) and Heinz History Center (Strip District) shops. The book is also for sale at the Carnegie Museum of Art Store (Oakland), Andy Warhol Museum (North Side) and Silver Eye Center for Photography (South Side).